Western Disturbances – Weather associated with Western Disturbances – Importance of Western Disturbances. Cloudburst in Jammu and Kashmir, Himachal Pradesh, Uttarakhand. In the winter season, the sub-tropical jet (STJ) is bifurcated into two branches due to physical obstruction of the Himalayas and Tibetan Plateau. One branch is flows to the south of the Himalayas, while the second branch is positioned to the north of the Tibetan Plateau. The ridge of the jet stream creates anticyclonic (with clockwise air circulation) conditions over North-West India. Consequently, the winds tend to descend over the north-western parts of India, resulting into the development of atmospheric stability and dry conditions (anticyclonic condition = no rainfall). But the sub-tropical jet (STJ) causes periodic changes in general weather conditions. The STJ drives the temperate low pressures over Mediterranean Sea towards east across Afghanistan, Pakistan and reach north-west India. These storms are residual frontal cyclones which move at the height of 2000 metres from the mean sea level. 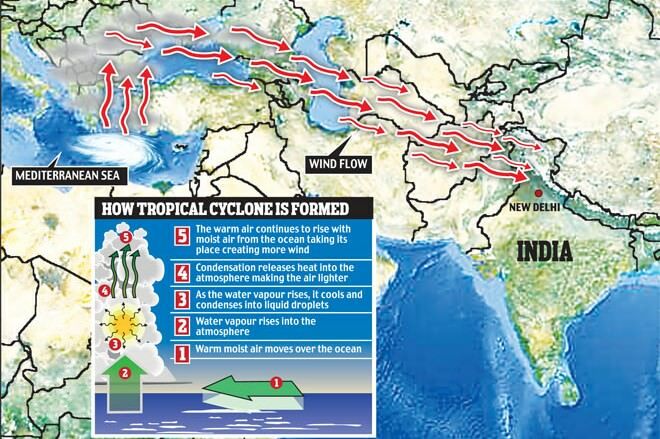 On an average, 4 to 6 cyclonic waves reach north-western India between October and April each year. The arrival of these temperate storms [remnants of temperate cyclones] [western disturbances] causes precipitation leading to an abrupt decrease in air temperature over North-West India. The weather becomes clear after the western disturbances passes away. 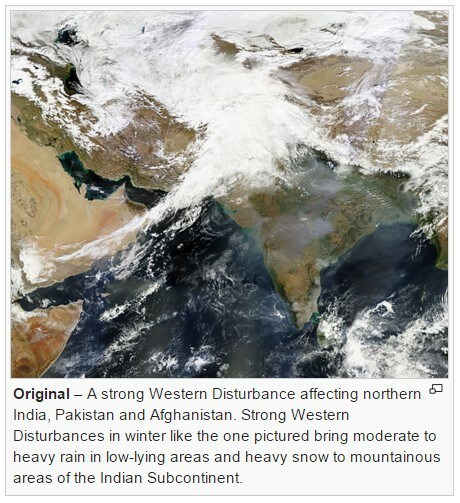 Western Disturbances also bring heavy snowfall in the Himalayan Region and a cold wave to north Indian plains. The western disturbances affect weather conditions during the winter season up to Patna (Bihar) and give occasional rainfall which is highly beneficial for the standing rabi crops, (wheat, barley, mustard, gram, lentil, etc.). A cloudburst is an intense torrential rainfall brought by a thunderstorm that lasts for a relatively short duration (few minutes to few hours). Cloudburst leads to flash floods and causes lot of damage to life and property. Every intense rainfall is not a Cloudburst. 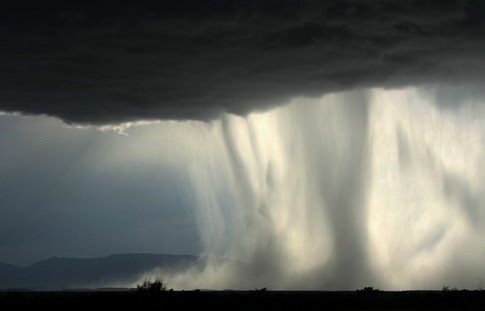 Cloudburst specifically occurs when an air mass with high humidity is struck at a place due to various reasons. In 2010, South-Western strip of Russia (Caucasus Region, Moscow etc.) saw higher than normal temperatures (highest in in the last 100 years) and there were numerous cloudbursts in Jammu and Kashmir. A strong upper-atmospheric high was located over European Russia towards the beginning of summer. 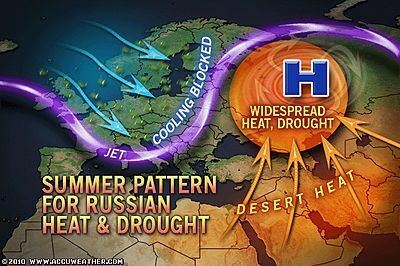 It diverted the jet stream (meandering of Sub-Tropical Jet Stream) and its rain-giving train (trough) of summer storms farther north than usual, giving much of Southern European Russia drought conditions. In addition, southern desert heat from central Asia, the Arabian Peninsula and North Africa began to flow northward, which strengthened this ridge of STJ and tightened its hold over the region. 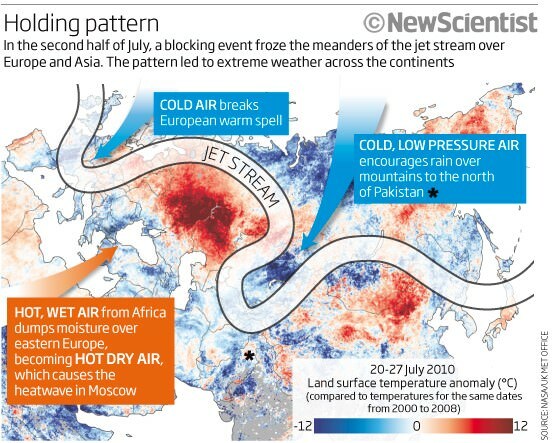 The stalled system prevented weather systems being drawn across Russia and the obstacle acted as a barrier trapping hot air to the south and cold air to the north. The consequence of this static mass of hot air was the heat wave that devastated Russia. 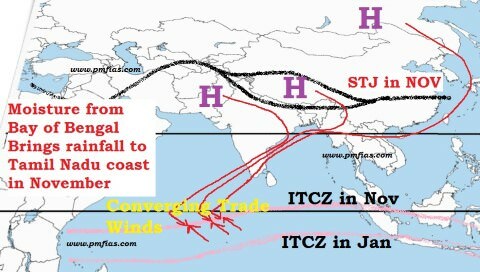 With the jet stream stalled the Sub-Tropical Jet was unable to transit across the Himalayas as it would do ordinarily, the monsoon cell to the south, fed by warmer waters in the Indian Ocean, had nowhere to go and as a consequence it deposited vast amounts of rain over Pakistan, Himalchal Pradesh and Jammu and Kashmir and this led to extensive flooding.